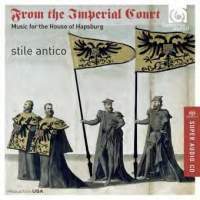 Here the 16 singers of Stile Antico reinforce their already formidable reputation: intonation and balance are always flawless; the sound of the voices is glorious, precise and absolutely crystal-clear; the music always moves along effortlessly with well judged moments of pressure and relaxation, despite their having no conductor. Unusually for such a group, they have no male altos, being exactly half women and half men. Nobody is about to discuss the likelihood of such an ensemble in the 16th century; but the sound quality and the musicianship justify their decision. Their programme covers the whole of the 16th century and is all continental apart from Loquebantur variis linguis of Tallis. Their range of colours and attacks results in each piece being nicely characterised. On the other hand, the presentation and accompanying materials are a mess. Only about half the pieces are ‘From the Imperial Court’, though most of the rest qualify for the tiny-print subtitle ‘Music for the House of Hapsburg’. Confusion reigns over the contents and order of the recording, which is inconsistent across the track-listing on the back of the box, the booklet-note and the actual recording (the order on the disc is musically good). The piece here credited to Senfl was revealed more than 50 years ago (in a famous article) as being by Costanzo Festa and having nothing to do with the Emperor Maximilian’s funeral. Several other details are either out of date or plain wrong.